The Western Florida Chapter of ACHE invites you to our Innovation Summit. Precision medicine and Telehealth hold great promise for improving the delivery of healthcare. Telemedicine has become increasingly popular throughout the years. Its innovative benefits are of vital interest amid the implementation of the Affordable Care Act. Telemedicine uses a variety of forms of electronic communication technology to provide a convenient method to deliver healthcare services and education. Advances in precision medicine have already led to powerful new discoveries and several new treatments that are tailored to specific characteristics, such as a person’s genetic makeup, or the genetic profile of an individual’s tumor. As the number of effective targeted therapies grows, more patients are being assessed for genetic variations; indeed, some experts believe that sequencing a patient’s genome will soon be standard procedure. But there are many challenges being faced including enormous costs of treatment, regulatory, infrastructure, logistical, and ethical issues. ACHE has awarded 3.0 Face-to-Face Education credits for this event for the panel sessions. 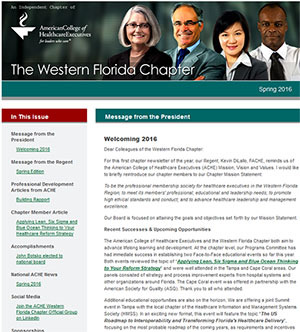 As an independent chartered chapter of the American College of Healthcare Executives, Western Florida Chapter is authorized to award 1.5 hours of ACHE Qualified Education credit toward advancement or recertification in the American College of Healthcare Executives.